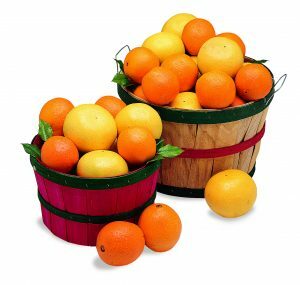 You’ll get plenty of raves when they receive one of these big beautiful baskets. 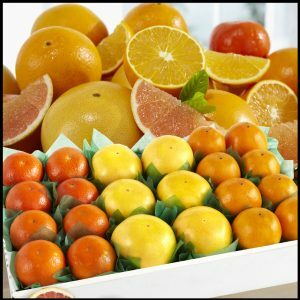 They are filled from bottom to top with premium citrus and plenty indulgent treats. 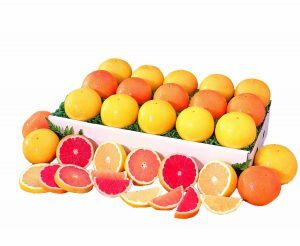 Large Basket Includes: 8 Oranges, 4 Tangerines, 4 Ruby Red Grapefruit, Chocolate Dipped Coconut Patties, Orange Marmalade, Fruit Candies, Pecan Roll, Key Lime Cookies, Gourmet Chocolates and Orange Blossom Honey. 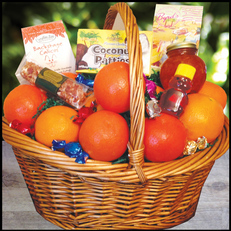 Small Basket Includes: 6 Oranges, 3 Tangerines, 2 Ruby Red Grapefruit, Chocolate Dipped Coconut Patties, Orange Marmalade, Fruit Candies, Pecan Roll, Key Lime Cookies, Gourmet Chocolates and Orange Blossom Honey.